Apostrophe Gallery's Sei and Ki Smith, whose pop up art shows have appeared in places as unexpected as the Kosciuszko St J train station, recently tried out a new venue for one of their guerilla art operations: the Whitney. 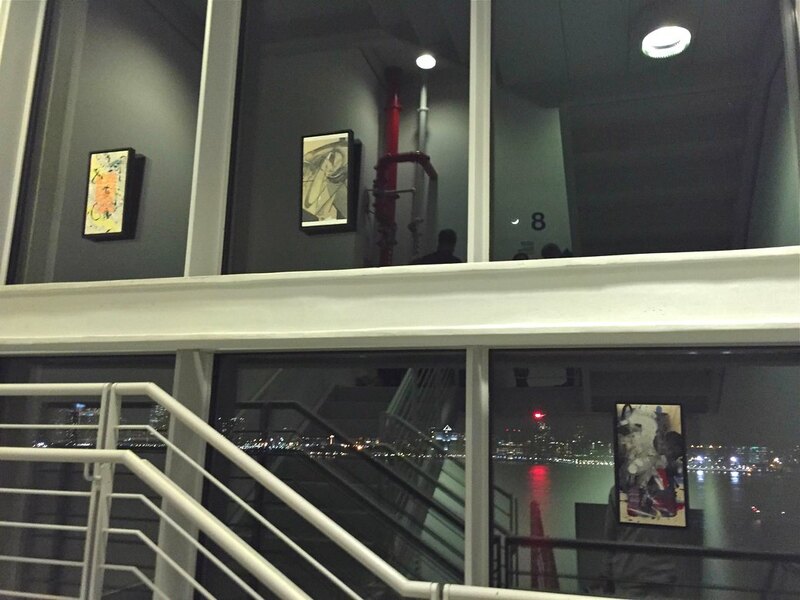 On Friday, March 11th, their Base 12 Project, turned a glass-walled stairwell into an exhibit hall. In order to maximize engagement, the Smith brothers, who grew up immersed in the Manhattan art scene and are both accomplished multimedia artists (perhaps you've heard of Sei's band Casper Television) staged their show on a pay-what-you-wish night and flooded the stairwell with the work of the 12 artists participating in the takeover. For 40 minutes, the pop-up gallery flew under the radar, and guests engaged with the art in the same way they might in the Whitney's climate-controlled, sanctioned spaces. Sei told TimeOut New York that the aim of the Base 12 show was to "involve as many people as we can in a discussion about the boundaries of curating shows, especially the art world as a whole." The twelve artists were: Sei Smith, James A Reyes, James Rubio, Ryan Bock, Alana Dee Haynes, Bruno Smith, Julia Powers, Charlie Hudson, Kolter Hodgson, Morell Cutler, Caslon Bevington and The Love Child. Check out their work in the video of the event below. Sei and Ki were punished with a lifetime ban from the Whitney, a punishment they called a "fair trade" in their press release. The brothers made a name for themselves in Bushwick with an innovate gallery/party space on Irving Ave. Keep an eye out for the next event, taking place at an undisclosed location some time in April, according to Ki.